Can anyone tell me at what point in the war the soldiers uniform would have changed over to the General service Buttons please, i am a bit confused to be honest, the question comes from the battlefield finds where they discover the remains of those lost in WW1 but some still have there unit buttons rather than the general service buttons, i spoke to a few Men of the Bedfordshire Yeomanry, 148 Field Regiment from WW2 who said they had the BY with the cross lances till they were called up at the outbreak of war then had to change them, was this the same for those during WW1? 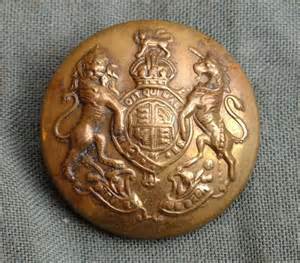 The buttons were adopted in 1871 and used by all except Foot and Horse Guards and cavalry, including some yeomanry. During WW1 it was common for some units to somehow get hold of regimental buttons for their SNCOs, but as a general rule most units, less those mentioned used the GS button. For specific regiments you would need to consult their history to clarify any exceptions to the norm. Sorry we didn't answer your question fully. The infantry went back to regimental buttons around 1924 (Ripley 1971). 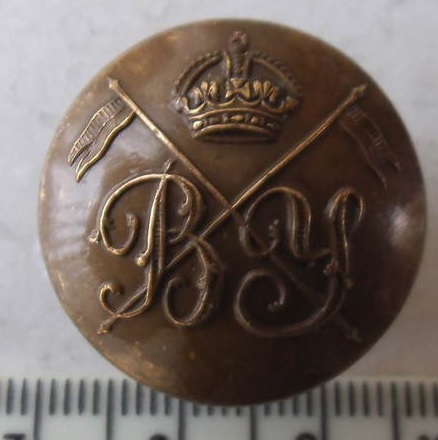 As regards the 148 Field Regiment Bedfordshire Yeomanry, what buttons did they change to, was it the RA button? Mick. In a photo i have taken of one of the men in 1938 and you can see Royal Artillery buttons, i remember one of the men saying that once war broke out they had to change to General Service buttons (they were using old WW1 uniforms as they didn't get an issue of 37 pattern battledress until early 1940), being 19 year olds they had never done this in there lives so many mothers did the honors for them, i am trying to find out the periods that the Bedfordshire Yeomanry Buttons were used on the Tunics, That the BY with the Cross Lances rather than the BIY from the Boer war period, the men i used to go and see regarding WW2 have passed away now and wish i would have asked more questions. They would have been wearing the button below after the change in name from Bedfordshire Imperial Yeomanry to Bedfordshire Yeomanry on 1st April 1908. Unless you can find stores record that's probably as close as we can get. Mick This is an officers button. I know a hell of a lot more than i did in respect of the Boer War/WW1 period, i know in the 1930s they used the Royal Artillery buttons but after WW1 the cavalry was obsolete. There is an amazing amount of knowledge from the forum members on here and gratefully received. Any pictures of General Service buttons, please?